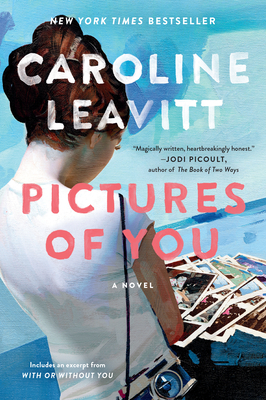 Caroline Leavitt is the award-winning author of twelve novels, including the New York Times bestsellers Pictures of You and Is This Tomorrow. Her essays and stories have been included in New York magazine, Psychology Today, More, Parenting, Redbook, and Salon. She’s a book critic for People, the Boston Globe, and the San Francisco Chronicle, and she teaches writing online at Stanford and UCLA. Why do you think Leavitt describes the pivotal accident in the book three times, from the point of view of Isabelle, Sam, and then from Bill? What do you think this is saying about how we see events in our lives and whether or not we can ever really know the whole truth? Do you personally think anyone can ever really know the truth? Pulitzer Prize winner Robert Olen Butler commented that Leavitt’s book is about “how each of us tries to shape our deepest sense of self, challenged not only by other souls in similar pursuit, but by the very forces of life itself.” How do you see this played out in Pictures of You or in your own life? What’s different about the ways in which April and Isabelle are running away? What do you think would have happened with April if she had not made the choice to leave? And why do you think she was really outside the car? Some of the characters in Pictures of You engage in magical or wishful thinking. Sam believes he has seen an angel. Isabelle is told she has a special gift to foresee the future lives of the children she photographs. How do you think this magical thinking helps and hinders the characters, and have you ever used such thinking in your own life to get through a painful situation? Sam’s asthma impacts his life, April’s and Charlie’s. At one point, on page 64, April tells Charlie that she heard that “breathing is our contract to stay on this planet,” that people with respiratory problems are “troubled souls.” If this is so, why do you think that Sam’s asthma vanishes? What made Sam want to stay on earth and survive? At one point, on page 69, Charlie asks, “Was any parent perfect?” Discuss the ways April and Charlie were both good and a highly imperfect parents. Was there anything they could or should have done differently, given Sam’s terrifying illness? Do you think parenting ever turns out the way you expect it to? On page 76, Charlie’s mother criticizes the way Charlie sees her relationship with his father by saying, “You know what you want to remember. You saw what you wanted to see.” Early in the novel, Sam remember how he and his mother used to go on short trips and pretend to be other people with other lives. Why do you think people need to create different realities for themselves? What function can it serve and how can it be both helpful and harmful? As Isabelle teaches Sam about photography, she explains that photographs sometimes show things that aren’t there. She tells him that he has to learn to look deeper, to see what might be hidden, and in a way, she’s really talking about people, as well as photographs. How much do you think we can ever really know about the people we love? Sam tells his father that he is a superhero and that his special gift is “to survive things.” How good a job is Sam doing surviving what happened to him? Leavitt’s book explores the many different kinds of love: the love of a mother for her child, the love of husband and wife, and some unexpected kinds, too, such as Isabelle’s devotion to Nelson her tortoise. Why do you think Isabelle’s love for her tortoise figures so prominently in the novel? Why do you think Isabelle fell in love with a tortoise, rather than a dog or a cat? Charlie spends most of the novel searching for answers why his wife was on a deserted foggy road with his son, and in the end, the answers, and the true story, come from a man we and Charlie don’t know and haven’t seen before. Why do you think Leavitt chose to tell the story of the accident three separate times and to reveal the mystery this way? What does this say about the stories we tell ourselves about the ones we love, and the way we might find out ultimate answers? Why do you think Leavitt allowed Bill to tell his own story about what happened the day of the accident? Why do you think Bill tried to find April after all that time? Why do you think Leavitt chose to flash forward thirty years and show Sam as an adult? How would the novel have been different if it ended with Sam as a child? Was Sam’s life what you expected it might be or were you surprised by his choices? Leavitt has said that the novel is about the stories we tell ourselves about the ones we love. How do the stories keep each person from truly seeing the one they love? On page 304, Isabelle’s driving teacher tells her that “people who are frightened, who don’t know where they’re going are the best students.” Why, in the context of the book, do you think this is true? The novel asks, can we forgive the unforgivable? Do you think Charlie ever really forgives April? Do you? At the end of the novel, Sam wonders if his whole life might be perfect, “or just this moment. And would it be enough?” What do you think he means. And what do you think the answer to that question might say about Sam’s worldview? What do you think the title, Pictures of You, really refers to? Leavitt has said that she wanted to create a never-ending story that would make readers wonder about the characters long after they turned the last page. What do you think happens to Sam? Do you think Charlie and Isabelle ever meet again?